Difference between revisions of "Sega Model 3"
[https://segaretro.org/Sega_Model_3 Sega Model 3] is an arcade platform released in 1996 as the successor to [[Sega Model 2]]. Model 3 mostly continued arcade games series established on previous Sega arcade boards, with games such as; Daytona USA 2, Sega Rally 2, Virtua Fighter 3 and Star Wars Trilogy Arcade. Upon release, the Model 3 board was more powerful than any other arcade platform on the market, as well as any home console or computer at the time; it took several years for home systems to catch-up. Model 3 was followed by [[Sega NAOMI and variants|Sega Naomi]] in 1998 which uses a similar architecture to the [[Sega_Dreamcast_emulators|Sega Dreamcast]]. It had an IBM-Motorola PowerPC 603e that could be at 66 MHz, 100 MHz, and 166 MHz with 33,321KB of RAM. It's GPU was 2 Lockheed Martin Real3D/Pro-1000. [https://segaretro.org/Sega_Model_3 Sega Model 3] is an arcade platform released in 1996 as the successor to [[Sega Model 2]]. 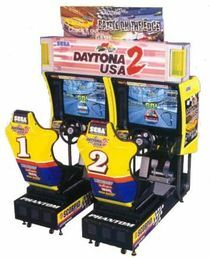 Model 3 continued several arcade games series established on previous Sega arcade boards, with games such as; Daytona USA 2, Sega Rally 2, Virtua Fighter 3 and Star Wars Trilogy Arcade. Upon release, the Model 3 board was more powerful than any other arcade platform on the market, as well as any home console or computer at the time; it took several years for home systems to catch-up. Model 3 was followed by [[Sega NAOMI and variants|Sega Naomi]] in 1998 which uses a similar architecture to the [[Sega_Dreamcast_emulators|Sega Dreamcast]]. It had an IBM-Motorola PowerPC 603e CPU that could run at 66 MHz, 100 MHz, and 166 MHz with 33,321KB of RAM. It had two Lockheed Martin Real3D/Pro-1000 GPUs. *'''[[Supermodel]]''' is an open-source Sega Model 3 emulator. The aim of the Supermodel project is to develop an emulator that is both accurate and playable. It is in an early stage of development, meaning it lacks several planned features (such as a user-friendly graphical interface). It has an [https://www.youtube.com/watch?v=2u9dbWuclBc experimental] [https://www.youtube.com/watch?v=9_JYbQYZ2hc multi-player network] build (~6 games supported for now). Make sure to use the latest [http://www.emucr.com/search/label/Supermodel SVN version] since the build on the home page is severely outdated, and check out the [https://www.supermodel3.com/Help.html help page] for instructions on how to use it. A [[libretro]] port has been [https://www.patreon.com/posts/reicast-libretro-19733457 confirmed] to be in the making. *'''[[MAME]]''' has a driver for Sega Model 3 but emulation is in a preliminary state, with no games marked as working yet. It is slow and has lots of bugs, some games hang or crash. This list was once updated as of Supermodel 0.2a ([https://www.supermodel3.com/About.html compatibility list]) and MAME 0.197 (no games marked as working yet). The Supermodel category has been updated since then (Check video of emulated games below). Sega Model 3 is an arcade platform released in 1996 as the successor to Sega Model 2. Model 3 continued several arcade games series established on previous Sega arcade boards, with games such as; Daytona USA 2, Sega Rally 2, Virtua Fighter 3 and Star Wars Trilogy Arcade. Upon release, the Model 3 board was more powerful than any other arcade platform on the market, as well as any home console or computer at the time; it took several years for home systems to catch-up. Model 3 was followed by Sega Naomi in 1998 which uses a similar architecture to the Sega Dreamcast. It had an IBM-Motorola PowerPC 603e CPU that could run at 66 MHz, 100 MHz, and 166 MHz with 33,321KB of RAM. It had two Lockheed Martin Real3D/Pro-1000 GPUs. Supermodel is an open-source Sega Model 3 emulator with good compatibility. The aim of the Supermodel project is to develop an emulator that is both accurate and playable. However, after several years of development, it still lacks a lot of the originally planned features (such as a user-friendly graphical interface). It has an experimental multi-player network build (~6 games supported for now). Make sure to use the latest SVN version since the build on the home page is severely outdated, and check out the help page for instructions on how to use it. A libretro port has been confirmed to be in the making. MAME has a driver for Sega Model 3 but emulation is in a preliminary state, with no games marked as working yet. It is slow and has lots of bugs, some games hang or crash. This list was once updated as of Supermodel 0.2a (compatibility list) and MAME 0.205 (no games marked as working yet). The Supermodel category has been updated since then (Check video of emulated games below).